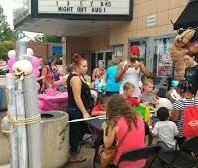 CELEBRATE OUR ANNUAL COMMUNITY NIGHT OUT AGAINST CRIME - AUG. 7TH! Be sure to join us Tuesday, August 7 from 6:30 to 8:30 pm at RESERVOIR PARK - it's time to celebrate our annual Community Night Out Against Crime! Every year, Goodyear Heights has one of the largest celebrations in the city, as people throughout Akron's many neighborhoods turn out to have fun, make new friends, learn about their community and find out how we can keep our streets safe and crime free. There's a lot going on across the city of Akron, and this is your chance to find out more about city programs, public safety and the positive changes that are coming to our neighborhood - including Reservoir Park and the Goodyear Boulevard business district. Bring the kids and join the fun as this family-friendly event. FEATURED HOUSE: 1402 Goodyear Blvd. LOTS GOING ON THIS WEEK & NEXT! If you want to help our neighborhood, patronize our neighborhood businesses! It's the best way to support jobs and maintain a healthy economy in the area--while ensuring that Goodyear Heights continues to offer the convenient services and amenities that healthy neighborhoods provide. CHECK OUT THE LINK TO OUR BUSINESS DIRECTORY.